Ken Wade (left) and Pete Howson won the Hotpoint AC pairs match. Several of the city’s top anglers were lining the banks at the Glebe Fishery on Saturday hoping to make it through to the £65,000 grand final. But with only one angler making it through to the big Maver Match This event it was always going to be a tall order to qualify. So spare a thought for local rod Tom Edwards, who finished runner-up with 180lb and but for a few lost fish could well have gone really close. Qualifier for the final was Garbolino star Simon Fry, who put a massive 203lb 12oz to the scales. The big match boys were back in action at Rookery Waters looking for a place in their big £1,000 fishery final in August. First to make his mark was the in-form Tony Dawson and what a year he is having. He’s hardly out of the frame these days and has already won countless matches in 2016. He notched up yet another victory in the Saturday qualifier fished on the Magpie Pool. Drawn on peg 35, he fished corn and dead maggot over micros and groundbait fished down the edges for 121lb. Runner-up and just missing out on booking a place in the August final was last year’s victor Gavin Butler from peg 13 with 109lb 14oz followed by Josh Pace with 106lb 6oz. After a very disappointing first match of the year on the Beastie Lake on the Decoy complex, I could not wait to get back into action on the Horseshoe Pool. Match-fishing wise it has to be one of the best lakes at the fishery because athough it has fancied pegs, you can never be sure where the winner will come from. In the latest Hotpoint AC match I drew peg 14, not where I really wanted to be but a good peg. With no fish willing to feed up in the water after a wasted hour I caught most of my wining 88lb 14oz net of carp on the deck with expander pellet. Second on peg two was Paul Faulkner, who caught on paste close in for 86lb 4oz, with Colin Buckingham third fishing the feeder for 55lb 10oz. The pairs event was won by Pete Howson and myself with a combined weight of 142lb. There were some good weights taken in the JVAC match on the Six Island pool on Sunday. Topping a strong field from peg 12 was Barry Gilson. He caught close in on cat meat, netting carp to double figures for a fine 137lb 5oz. Second with 89lb 5oz was Ray Pauley and third Nick Carlton with 88lb. 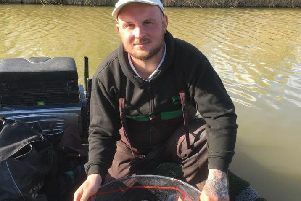 Ramsey AS fished the Willow Pool at Decoy on Sunday and leading the way with 76lb 12oz from end peg 30 was Paul Kilby. Then came Abi Kendall with 66lb 8oz and Ivan Steels with 64lb 12oz.